This is the tree that we recommend if you are inexperienced with bonsai or you do not have a green thumb. 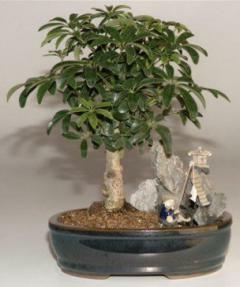 In our opinion it is one of the easiest bonsai trees to care for. We cut and cement rocks to one side of the pot with an ample well to hold water. A ceramic bridge is cemented to the rocks on either side. A pagoda figurine is also added and cemented to the stone located above the bridge. To complete the scene, we cement a miniature glazed mud figurine fisherman overlooking the water holding a fishing pole and fish.